Due to popular demand, and an almost sold out 10-performance run by our opening weekend, we're excited to announce that we are adding two more performances of The Lion, the Witch & the Wardrobe. Missed the preshow lecture last Friday? Click below to listen online to the engaging conversation with alumni Kaitlin Williams and Mack Gordon in conversation with professor Jan Wood as they discuss their love of theatre, the experiences here at the Phoenix, what they're doing now and their special connection to this play, The Lion, the Witch and the Wardrobe. In the press: "...it's safe to say the rest of the audience enjoyed the play just as much as I did." Here's a run down of what local media and reviewers are saying about The Lion, the Witch and the Wardrobe. Overall, it’s a charming show. Lewis’s rapturous, almost fetishistic descriptions of succulent meals remind us of food shortages suffered by post-war Britain. 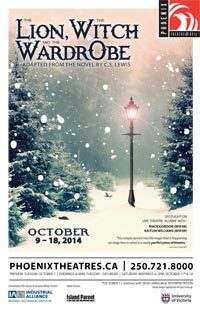 And the story’s Biblical echoes... give The Lion, the Witch and the Wardrobe a certain gravitas." "Situated eight years after the actual events in the Narnia series, it begins as Peter and Lucy come back to their Uncle Digory’s house in the country. Their imaginations take over, and they begin to remember the many adventures they experienced. 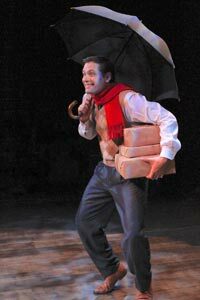 On opening night there were audience members as young as eight who remained rapt—captured by the spell of the action onstage—making this an ideal outing for parents and grandparents who are eager to introduce their offspring to live theatre." "UVic alumni Kaitlin Williams and Mack Gordon are strong performers, who have an ebullience appropriate for both their characters and their material. ... Their impressions of various creatures and characters are enjoyable, particularly Gordon’s obnoxious version of Edmund and Williams’ performance as Jadis, the evil queen. The staging and costuming are very clever and well-suited to the nature and subject matter of the show. The coats from the wardrobe are used as costumes... and an indoor lamp doubles as a lamppost when the stage is darkened to recreate the forest. Playful and with the improvisational spirit of children engaged in dress-up..."
"... each of the actors proved their talent. Mack Gordon’s humorous renditions of Mr. and Mrs. Beaver provoked spurts of laughter from the audience and Kaitlin Williams displayed astounding versatility in her performance. Her voice portrayal of the White Witch, in particular, was haunting in its authenticity. Shifts in location and emotional atmosphere were portrayed to great effect by the warming or cooling of the stage lights ... which sprinkled the production with a hint of magic. 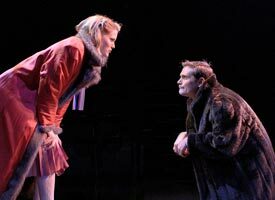 If you're a Narnia addict you'll probably love this stage adaptation... Gordon and Williams... met while they were studying theatre (this is so beautiful), at university, at UVic, 10 years ago. They're lively, they're animated. They get it all right. Gordon is the stronger physical actor, his movement from the weaselly and traitorous brother, and turkish delight fancier, Edmund Pevensie, to the heroic sibling Peter, and then to the faun Mr. Tumnus and the beaver. It's slick, its fun to watch. He's got a great grasp of the little things that each of these characters must have to be instantly recognizable. Williams's best work, his wife, is the domineering and tyranical White Witch. And I like the way both actors tackle Aslan the Lion, sort of back and forth, quite clever. 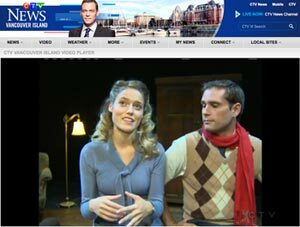 Listen to CBC's On the Island review with David Lennam. "The two actors, Kaitlin Williams and Mack Gordon... encouraged the crowd to use their imagination and executed a meaningful performance, without ever rearranging the set or changing costumes. ...Williams and Gordon put on a great show and I would gladly see it again. ...And judging by the "oohh"s and "aahh"s of the crowd and the nervous tick behind me that faded to a happy tap, it's safe to say the rest of the audience enjoyed the play just as much as I did." Read Erin Blondeau's full review in the Nexus. PHOTO CREDITS: Photos by Ron Reed and Michael Julian Berz for Pacific Theatre.